The (non-canon) image below is the first map I made of the “starting universe” for the This Corner of the Universe series. I had, essentially, just started creating the setting my series would take place in and all of my concepts were in their infancy. I don’t believe Heskan even had a first name yet. The map was last modified 11/8/2011, so it’s coming up on two years old. As you can no doubt see, it’s very crude with next to no detail. 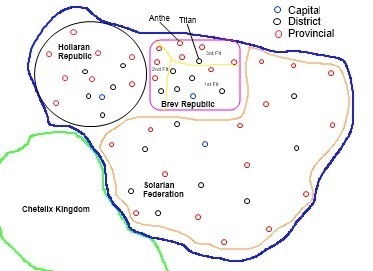 In fact, this map actually calls the Brevic Republic, the “Brev” Republic and the Hollaran Commonwealth a republic. This was changed later due to the evolving concepts I had about the Brevic and Hollaran governments to help draw some distinctions between Bree and Hollara. Yes, politics aren’t a major factor in the first book but they have a larger role in the coming books (as the story expands). The map also displays the preliminary borders of humanity with the Chetellx “Kingdom” (later changed to Empire). My original notions of that race made it somewhat a monarchy. However, that has changed as well. The borders between the two races shrank somewhat too. However, the basic shapes of all of the political entities generally persist when compared to the official versions. The maps posted on the stellar maps page are inviolate and won’t be changed (although that’s not to say they won’t grow in detail or expand in the terra incognita portions). One maxim I strongly subscribe to is that facts and information laid out in the early books of a series should not be changed to accommodate plots/stories in later books. At any rate, I just wanted to show one of my earliest efforts in the creation process of the TCOTU universe. From this simple little map, several ideas arose. Hopefully, those ideas will provide as much enjoyment to the readers discovering them as it provided me while conceptualizing them. This entry was posted in Author Notes, The Universe and tagged planning, scifi, star systems, writing. Bookmark the permalink.